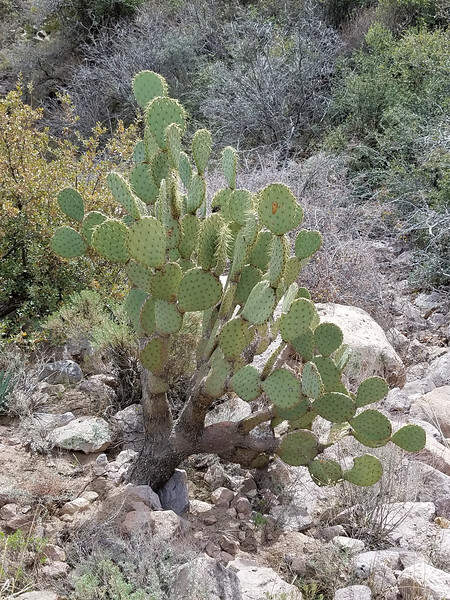 Lush canyons with sycamore and cottonwood trees, rugged mountains with pinyon pines and alligator juniper trees, hidden canyons, creeks and waterfalls, majestic deserts and wildflowers, prehistoric ruins, abandoned mines, prospector camps and ranches – all these are found in a wilderness close to Phoenix. The Superstition Wilderness is unlike the image most people have of a desert. It's very mountainous with elevations ranging from about 2,000 ft to 6,250 ft. The famous Weaver’s Needle, a weathered volcanic spire, rises to 4,553 ft. We'll have some minor elevation changes on our hike to camp, both up and down, but nothing too challenging. The trails are generally in good condition, but we'll do some touch-up work to keep them that way. If this winter's storms bring a good rainy season in the southwest, we'll witness a colorful blooming desert with many species of flowers. It's a natural garden! The history of the Superstitions is fascinating - from the early Spanish explorers and the Apaches to the crusty old gold prospectors. The legend of the "Lost Dutchman Mine" still inspires gold bugs to scratch around in the desert in search of the mysterious mine. Some experts think the Dutchman pulled off a successful hoax, so don't be fooled by any old timers who offer to sell you a "recently discovered" treasure map. Our service project includes maintaining wilderness trails in the Superstition Mountains, specifically the Campaign Trail. Trail maintenance in wilderness areas like this is a tool of both conservation and preservation. Involvement in this work allows one to connect to a wild place while simultaneously facilitating access for others to do the same. Notice the large woody trunk?